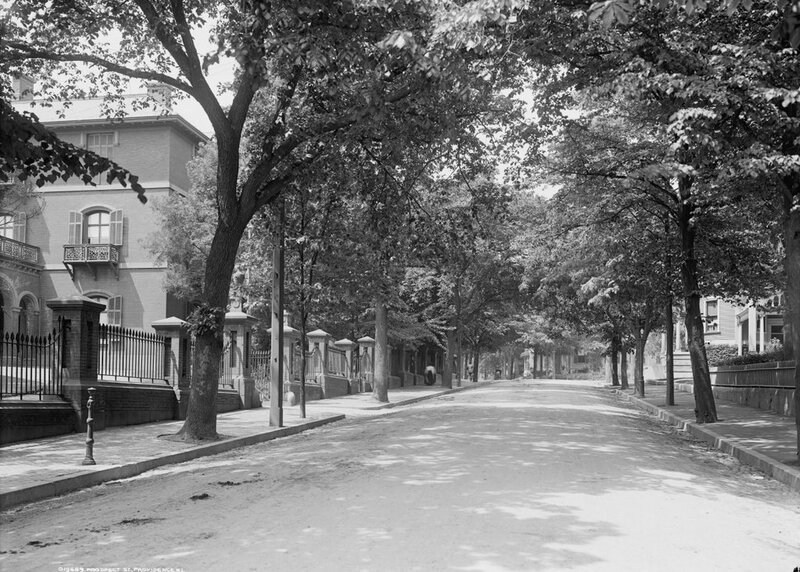 Looking north on Prospect Street near Olive Street in Providence, around 1906. Image courtesy of the Library of Congress, Detroit Publishing Company Collection. 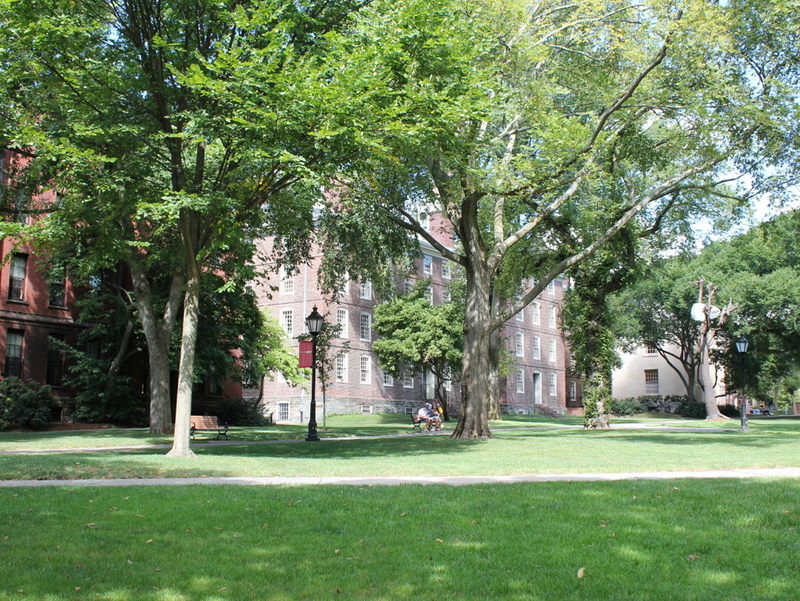 Providence’s College Hill neighborhood is the city’s premier residential area, featuring Brown University as well as numerous historic 19th century homes. 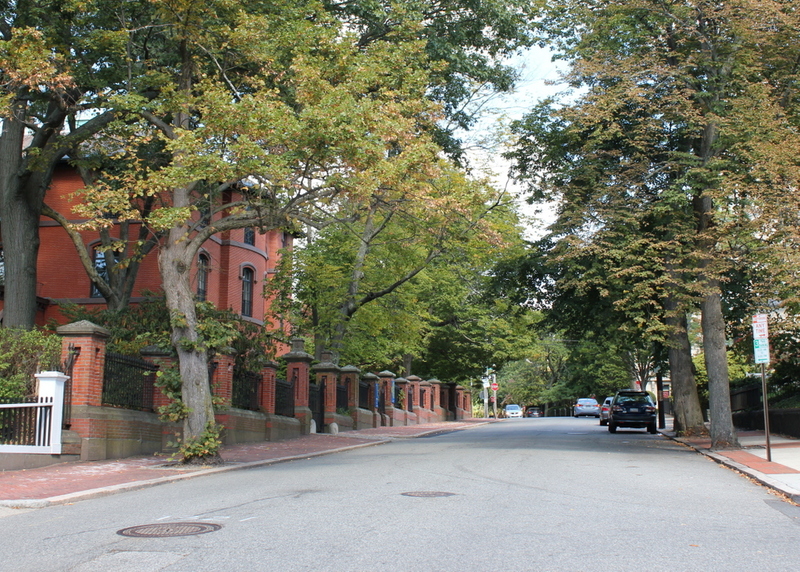 This section of Prospect Street is just a few blocks north of Brown, and includes one of the city’s largest homes, the Woods-Gerry House on the left side of the photo. It was designed by prominent architect Richard Upjohn and completed in 1863, and was built as the home of Dr. Marshall Woods, a Brown graduate of 1845 who remained involved in his alma mater for the rest of his life, including serving as the school’s treasurer from 1866 to 1882. After Dr Woods’s death in 1899, the house remained in his family’s ownership until 1931, when it was sold to Peter Goelet Gerry. It was subsequently sold to the Rhode Island School of Design in 1959, who planned to demolish it. The irony of a design school wanting to demolish the work of a pre-eminent 19th century architect was apparently lost on the school administration, but after many years of calls for its preservation, the school finally decided to restore it. Today, it remains in use as offices for their admissions department, and overall very little has changed in this scene during the past 110 years. 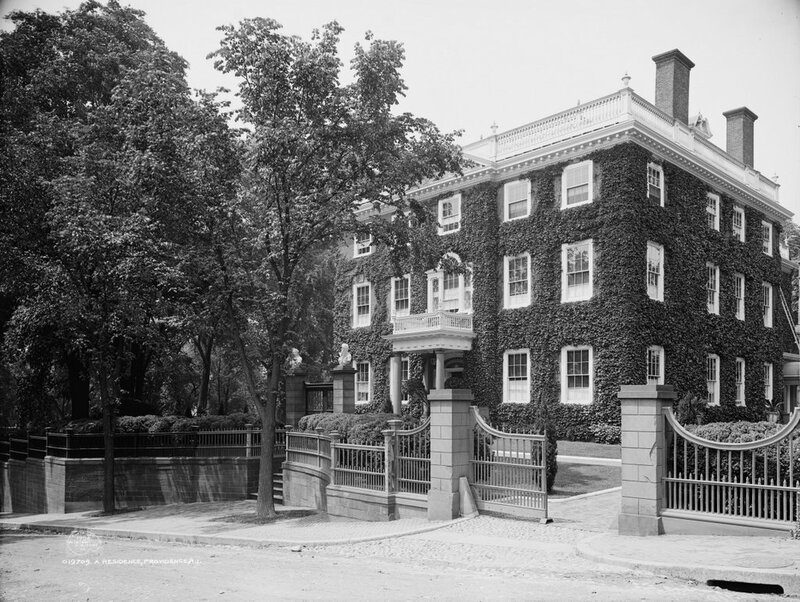 Rockefeller Hall, later known as Faunce House, on the campus of Brown University, around 1906. Image courtesy of the Library of Congress, Detroit Publishing Company Collection. This building at Brown University was built in 1904, a few years before the first photo was taken. It was originally named Rockefeller Hall in honor of its benefactor, John D. Rockefeller, Jr. 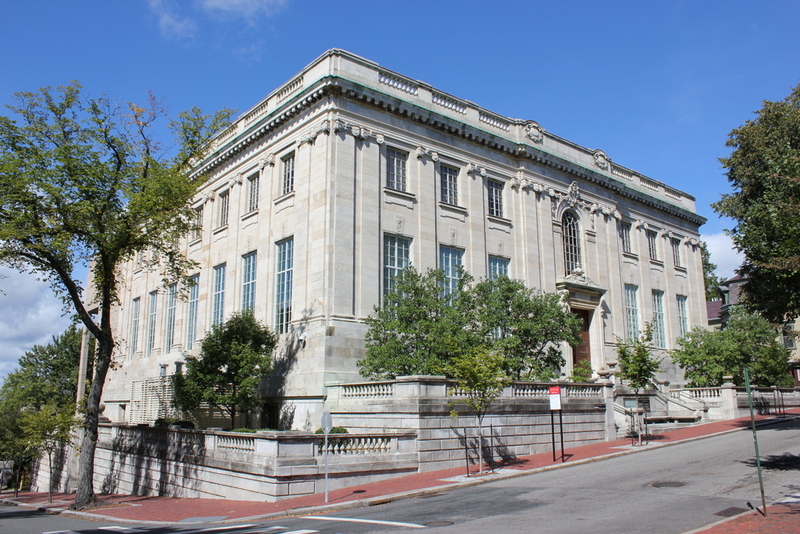 He had graduated from Brown in 1897, and although only 30 when the building was completed, he was already very wealthy thanks to his father’s fortune in Standard Oil. Along with being named for a prominent family, the building was also designed by one of the country’s foremost architects of the era, the New York-based firm of McKim, Mead & White. 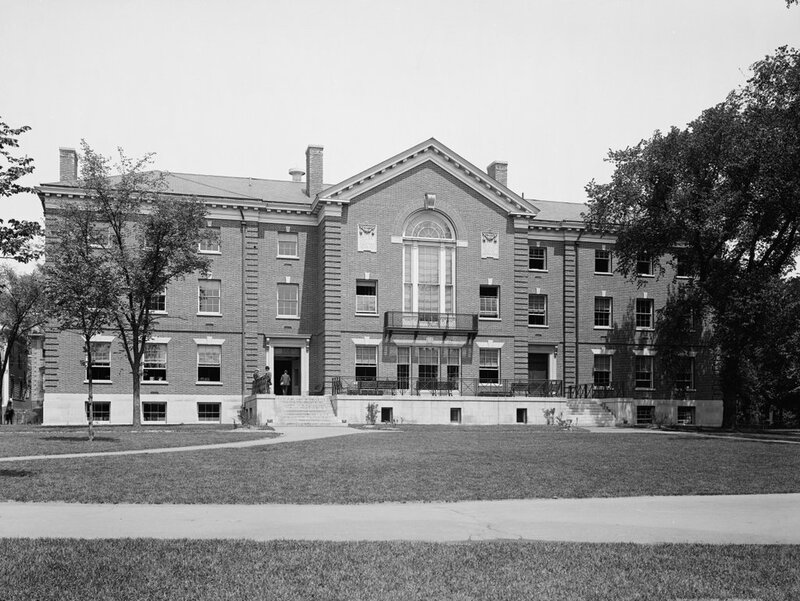 When completed, the building had a variety of different uses, including offices for student clubs, a bookstore, a reading room, an assembly hall, and offices for the YMCA. It was expanded in the 1930s, thanks to another donation from Rockefeller, who requested that the building be renamed Faunce Hall, in honor of the late William Faunce. He had been the Rockefeller’s pastor at the Fifth Avenue Baptist Church in New York, and from 1899 to 1929 served as Brown’s president. Today, the building still bears the name of Faunce, who remains the longest-serving president in the school’s history. 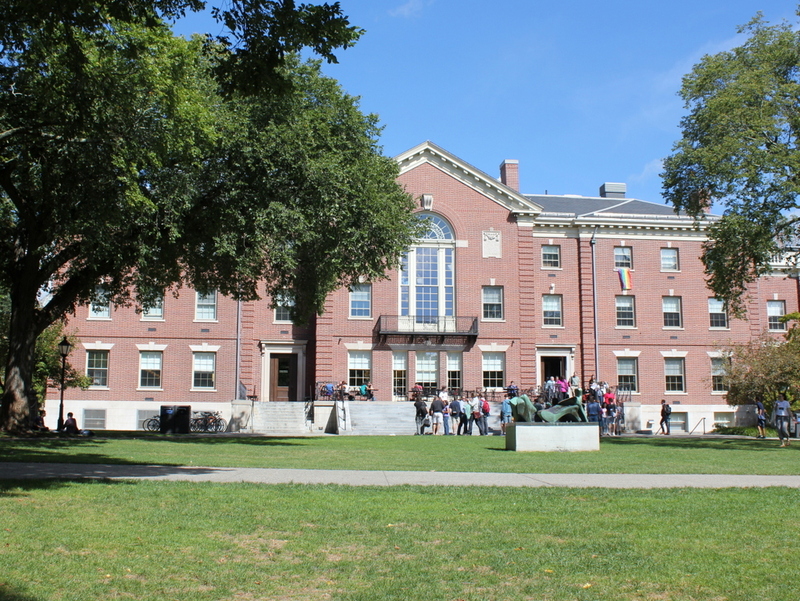 Aside from the 1930s addition to the right, not much has changed in its appearance, and it is still in use as a campus center more than 110 years after its completion. 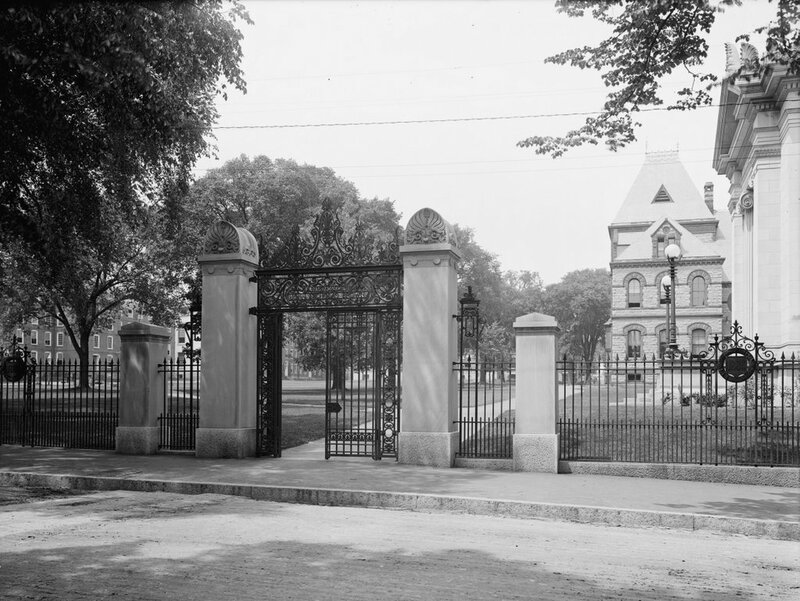 The John Nicholas Brown Gate on George Street, on the campus of Brown University, around 1906. Image courtesy of the Library of Congress, Detroit Publishing Company Collection. 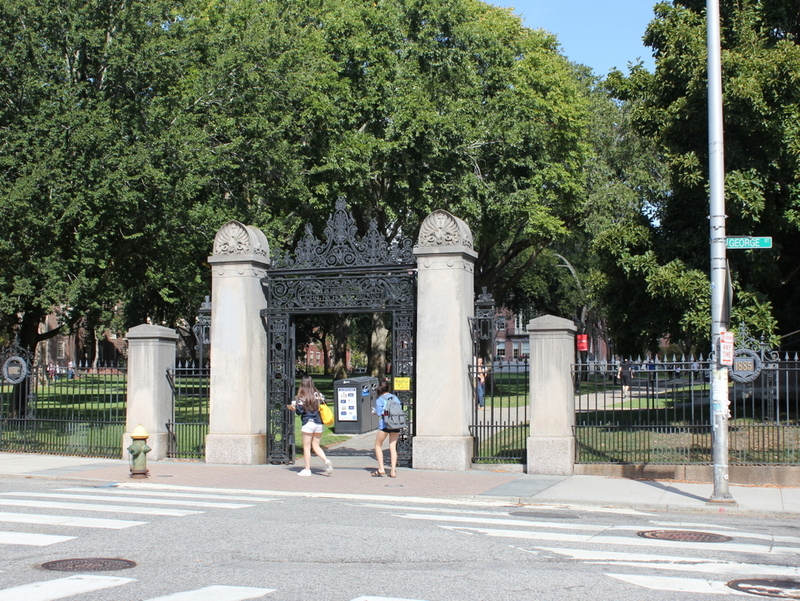 This gate on the south side of the College Green at Brown University is named in honor of John Nicholas Brown I, a member of the prominent Brown family. Not surprisingly, this family played a major role in the establishment and growth of the school, which had been originally founded as Rhode Island College. 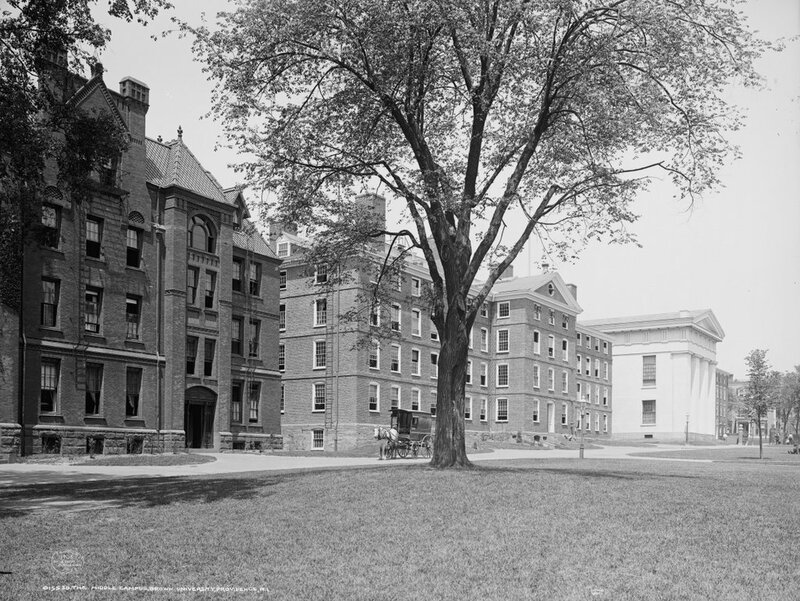 Not to be confused with the current institution of the same name, this school became Brown University in 1804, in recognition of benefactor Nicholas Brown. Nicholas’s descendants included his son, John Carter Brown, a book collector who amassed a considerable library of rare history books. After his death in 1874, his son, John Nicholas Brown, inherited the collection, and it later formed the basis of the John Carter Brown Library, located just inside the gate and to the right. 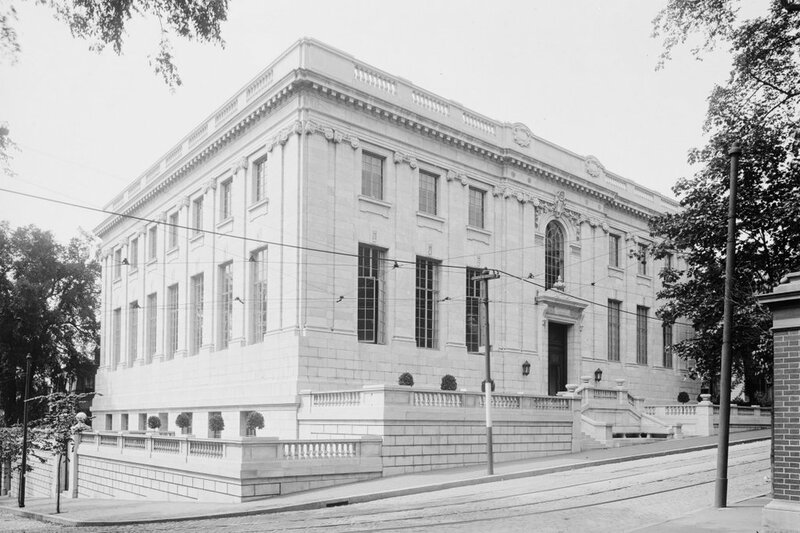 The library opened in 1904, four years after John Nicholas Brown’s death. The library’s opening coincided with the completion of this gate. While the library bore the name of his father, the gate was named for John Nicholas Brown himself, and was a gift of his widow. Their only son, John Nicholas Brown II, who had been just three months old when his father died, participated in the cornerstone laying in December 1903, and the gate opened for the first time five months later. Today, very little has changed in this view; the gate is still there, and the buildings in the background, although hidden by trees, are also still standing. The home of John Brown on Power Street in Providence, around 1906. Image courtesy of the Library of Congress, Detroit Publishing Company Collection. Not to be confused with the more famous John Brown who led the raid on Harpers Ferry, this house was the home of Rhode Island merchant John Brown. 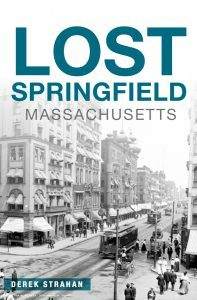 Although they shared a name, these two New Englanders could not have been more different; while one was executed after an attempt to violently overthrow slavery, the other, who lived here, built his fortune from enslaving people. Rhode Island’s John Brown was born in Providence in 1736, and had a profitable career as a merchant, including with the slave trade. 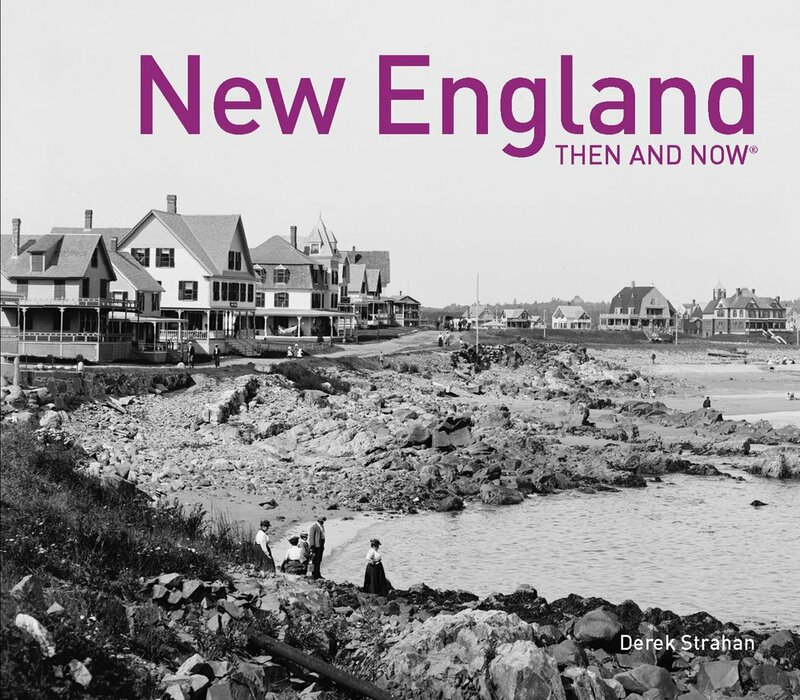 Slavery was not illegal in New England during the colonial era, and although it was not nearly as widespread as in the south, many New England merchants nonetheless became wealthy through the slave trade. Brown was also involved in trade with China, and during the American Revolution he invested in privateers that raided British shipping. Even before the Revolution, though, Brown showed an interest in the patriot cause. In 1772, he was one of the leaders of the Gaspee Affair, an early conflict between the colonists and British authorities. The HMS Gaspee was a British schooner that had been patrolling Narragansett Bay in an effort to stop the widespread smuggling that was occurring in the colony. While pursuing a smuggler, the Gaspee ran aground in nearby Warwick, prompting Brown and a group of other men to board the vessel and burn it. Although it occurred nearly three years before the Revolution actually started, it was an early sign of the growing tension in the colonies. 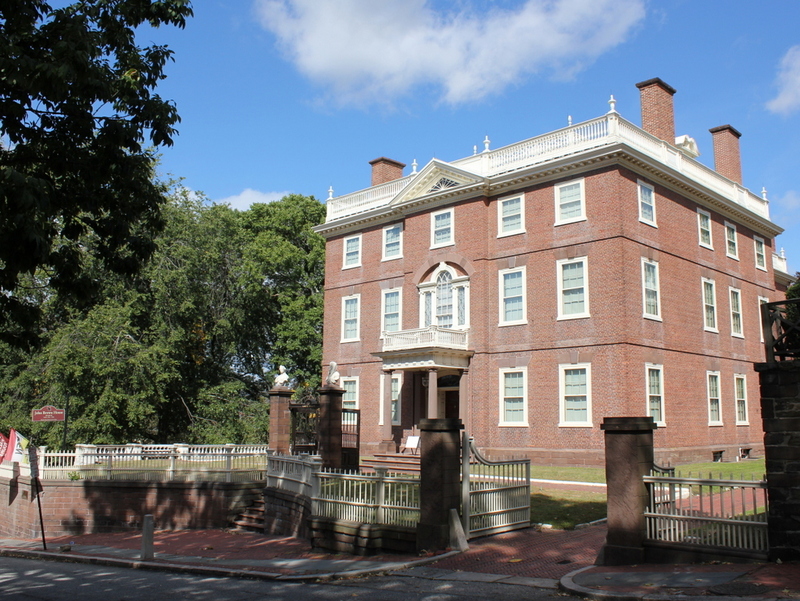 Following the war, Brown built this Georgian-style mansion on College Hill, near the campus of Rhode Island College. Brown was involved in the early years of the school’s history, and served as its treasurer for several decades. Other members of the Brown family were also highly influential, and in 1804 the school was renamed in honor of John Brown’s nephew, Nicholas Brown, Jr. John Brown’s house was among the first of many elegant mansions that would soon appear in the College Hill neighborhood, and the area later became the city’s premier residential neighborhood. The house was designed by Brown’s brother, Joseph, who had also designed Providence’s historic First Baptist Church building, and it was completed in 1788. During the time that Brown lived here, he was the subject of controversy over his slave trade practices. Some members of his family, such as his brother Moses, were abolitionists who opposed his occupation, but he also soon ran afoul of new slave trade laws, which forbade outfitting American ships to be used in the slave trade. Brown was the first to be tried under this new law, and in 1797 he was found guilty and forced to forfeit his ship. This conviction notwithstanding, Brown was elected to the US House of Representatives the following year, and served one term from 1799 to 1801. After Brown’s death in 1803, the house remained in his family for nearly a century. By the time the first photo was taken, it was owned by Marsden J. Perry, a prominent bank and railroad executive who purchased it in 1901. He made some modifications to the house, but overall it retained its original appearance, both on the interior and exterior. Perry died in 1935, and it was sold to John Nicholas Brown, the great-grandson of Nicholas Brown, the college namesake. He aimed to preserve the historic house, and in 1942 he donated it to the Rhode Island Historical Society, who has owned it ever since. Today, with the exception of the ivy on the walls, essentially nothing has changed about this scene, and the home is now open to the public as a museum.